GOLD COAST, AUSTRALIA -After a dominant race from beginning to end, Flora Duffy claimed the first gold medal of the Commonwealth Games in the Gold Coast and put temporarily her country on top of the medal table. Behind her, English Jessica Learmonth claimed silver, and Canadian Joanna Brown took the third place. 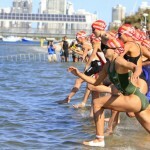 The race started with Duffy, Learmonth and Sophie Coldwell (ENG) leading the swim from the very first strokes, on a windy but really warm day in Southport Broadwater Parklands. 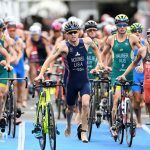 With the water at 24.1 degrees, the hot and humid conditions were hard for all the athletes, but Duffy and Learmonth imposed a frantic rhythm as soon as they mounted their bikes, a few seconds ahead of all the other athletes. The two of them worked together to build up a difference enough to maintain them away from the chasing pack, which included some strong runners, such as Ashleigh Gentle (AUS), Vicky Holland(ENG) or Joanna Brown (CAN). Halfway through the fast and flat course, the leading duo had almost one minute difference over the chasers, and by the end of the 20km bike, the two of them managed to keep it to almost one minute. A minute that proved to be too much for the chasers. With Flora speeding up in the first meters of the 5km run, Learmonth tried to keep up the pace but looking nervously behind her every few meters. She had a reason to do it. 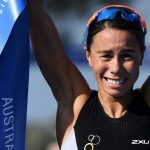 Behind her, and coming strong, her teammates Coldwell and Holland, along with Gentle and Brown were speeding up, cheered by the thousands of spectators lining up along the course in Southport Broadwater Parklands. 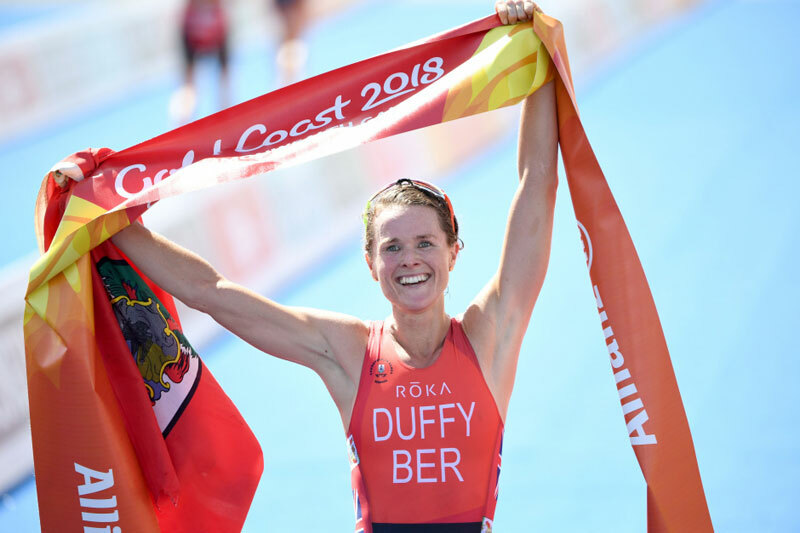 The last kilometer looked like a fun run for Duffy, smiling and being cheered on by the spectators, knowing that the first medal of the Games was almost hers. And indeed it was. Looking confident and grabbing a Bermudian flag, Flora crossed the finish line to claim her first ever gold medal on the Commonwealth Games, stopping the clock on 56:50. She will now have two more chances of grabbing medals: in the Mixed Relay this Saturday, and on the Women’s Cross Country Mountain Bike race next Thursday. “I came in the favourite so that adds its own pressure”, said Duffy after claiming gold. But it looks like the pressure was well handled. “I am getting used to the pressure – from 2016 (winning the ITU World Championships) I had to get used to it, it is the space in which I am. There will be media and people watching me, so I just try to forget about it and do my thing”, she explained. With the gold medal hanging brightly on her neck and a huge smile on her face, she said: “I’ve always dreamed of this so I can’t let it get to me. Jess was phenomenal. I held onto her, we work well together, we race so often together that we have an understanding. The Games don’t come around often and it’s hard to get into. I am from a tiny country with not a lot of medallists so I am expected to win. I try to forget about it because I do it every week, so that’s how I deal with the pressure. There’s a 50-foot poster of me in town. Being an introvert it gets a bit much, but it’s great to inspire,” said the Bermudian, who has chances of getting two other medals in these Games. But the biggest smile while crossing the finish line was indeed Joanna Brown’s. After crashing in Abu Dhabi four weeks ago, and fracturing her shoulder, she didn’t even know whether she will be able to compete in the Games a couple of weeks ago. “There are no words to describe this feeling right now. It has been the most chaotic month, with fracturing my shoulder in WTS Abu Dhabi in March but I have had the most incredible team of doctors and physiotherapists and coaches who have helped me a lot”, she said. 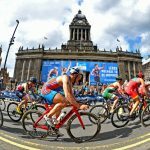 “I was kind of in the middle of the pack during the swim and then coming onto the bike I was a bit nervous having fallen off and fractured my shoulder less than a month ago so I just chilled on there. I haven’t done much road training so that also made me nervous. I have been doing a lot of running training so I knew that was going to be my strongest leg so I just ramped it up there. I really wanted it, so I’m super happy with the result”, she explained with her bronze medal already hanging on her neck. The bitter fourth place was for Vicky Holland, who took bronze in Glasgow 2014 but was not able to keep up the pace of Brown in the last meters of the run, while Aussie Ashleigh Gentle crossed the finish line in fifth. “I’m a bit disappointed, the run doesn’t usually let me down. Overall I’m disappointed I didn’t bring home a gold for Australia. It would have been nice to have better organisation on the bike,” said Gentle. Also disappointed was Kiwi Andrea Hewitt, one of the oldest triathletes in the field today with 36 years old, who lost almost 50 seconds in the swim leg, way too much for her aspirations for the podium, and ended up in the 13th place.